UNITED NATIONS, July 8 -- Months ago amid a soldiers' munity in Burkina Faso, Inner City Press asked the spokesperson for UN Secretary General Ban Ki-moon what the UN thought and was doing about it. First there was no comment, then Inner City Press was told that Said Djinnit of the UN Office for West Africa was “monitoring” the situation. But the report filed in the run up to the Security Council's semi-annual meeting Friday about UNOWA did not mention Burkina Faso, despite having sections on Benin, Cote d'Ivoire, Guinea, Niger and the Cameroon - Nigeria Mixed Commission. Why not? Djinnit was supposed to be the guest at the UN's noon briefing on Friday, and had finished his closed door briefing to the Council before noon. But he did not appear for the briefing, nor back at the Council stakeout. Not everything goes in the report, he said cryptically. Why not put it in the report, then? Burkina Faso is known to not want to be discussed in the Council. The country and its diplomats are used by the UN, and US and former colonial power France, on Darfur and Cote d'Ivoire. Inner City Press is told that Djinnit routinely praises the long-serving Campoare. To openly discuss mutinies in the country is inconsistent with all this -- and so it is not in the UN report, and is confined to closed door consultations. And so it goes at the UN. UNITED NATIONS, June 4 -- Now that the fighting in Burkina Faso has killed civilians, the UN's long silence seems all the more strange, when contrasted to its comments on unrest in other countries. 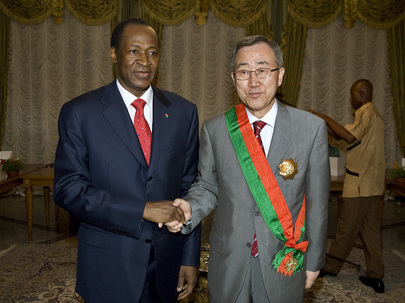 On June 1, Inner City Press asked the Office of the Spokesperson for Secretary General Ban Ki-moon what the UN had to say about the ongoing mutiny in Burkina Faso, which resulted in 24-year rules Blaise Campaore dissolving the government and calling home UN Darfur mediator Djibril Bassole as foreign minister. INNER CITY PRESS: I just wonder if anyone at the UN is tracking these mutinies in Burkina Faso where the army has been for several months rebelling against the Government. There is just now a recent outbreak of shooting in the main town, and I just wonder, does the Secretary-General have, you know, I don’t know… is there… Burkina Faso is a big contributor of peacekeepers, a big player in peace initiatives in Africa — has there been any statement at any point by the UN about this ongoing turmoil in Burkina Faso? That day, the UN Spokesperson's office had no comment, merely saying that Ban's Department of Political Affairs was watching and would be checked with. Later Inner City Press was told that Ban's envoy for West Africa Said Djinnit was “of course monitoring,” but chose not to say anything. And now, Campaore's forces have rumbled into the second city of Baso Dioulasso and at least seven have been killed, including a young girl. Colonial power France is said to be watching. Some wonder, watching to make sure the UN doesn't criticize? We'll see. UNITED NATIONS, June 4 -- Amid news that Ali Abdullah Saleh is leaving Yemen, under the immunity deal he has three times before rejected, the United Nations' engagement with Saleh's thirty year rule has come into focus. Inner City Press has repeatedly asked the UN Development Program about its director for Arab states, Amat Al Alim Alsoswa, who previously served as a Saleh minister and has since “been the UN's face” in the region, according to UN sources critical of Secretary General Ban Ki-moon's performance during the Arab Spring. The deal, which some say was developed with the input of the US Embassy in Sanaa, doesn't specifically name all of the Saleh associates who would be covered by it. Earlier this year, even as Saleh has started ordering the use of life ammunition against protesters in Sanaa, UNDP's Helen Clark visited the country accompanied by Amat Al Alim Alsoswa. In UNDP's statements, democracy and the right to peaceful protest were absent. 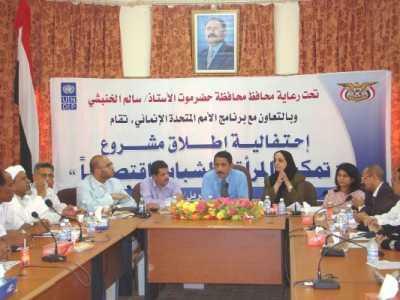 UNDP promoted the joint visit of Helen Clark and former Saleh minister Amat Al Alim Alsoswa on UNDP's Yemen web site. A visit to the site on June 4 found that it had not been updated for a month, and said virtually nothing about the killing of protesters. Likewise, the UN's Syria website has been fun of happy talk -- until it disappeared from the Internet on June 3 as part of Assad's crackdown on the 'Net. But why block access to the UN when it is aligned with the dictators? Watch this site.